About Trois-Rivieres Ford Lincoln Inc.
On behalf of everyone at the dealership, we would like to welcome you on our website and to warmly thank you for your interest. Since the beginning of our activities in 2002, we are proud to offer a high-qualified sales and after-sales service to all of our customers which sets us apart from our competitors. We have successfully earned the trust of our valued clientele with our passionate team of professionals, our competitive prices, our courteous service and our enthusiasm to go beyond your expectations. We possess a large fleet of pre-owned and new vehicles in order for us to better meet your needs and your budget. If you wish to enjoy a delicious breakfast or lunch between 7:30 am and 2:00 pm, there is a restauration area available to you every day of the week. Trois-Rivières Ford-Lincoln's team will make sure that your visit at our dealership will be a remarkable experience. We invite you to fill out our online form if you have any questions, suggestions or information requests on a vehicle or if you would like to schedule an appointment NOW with one of our sales representatives. You can also reach us by telephone at18887135426. We are located in front of the Laviolette Park at exit 181 on 55 highway in Trois-Rivières. Come meet us! It will be our pleasure to receive you at our dealership and introduce you to our team. For Trois-Rivières Ford, customer satisfaction is our number one priority. 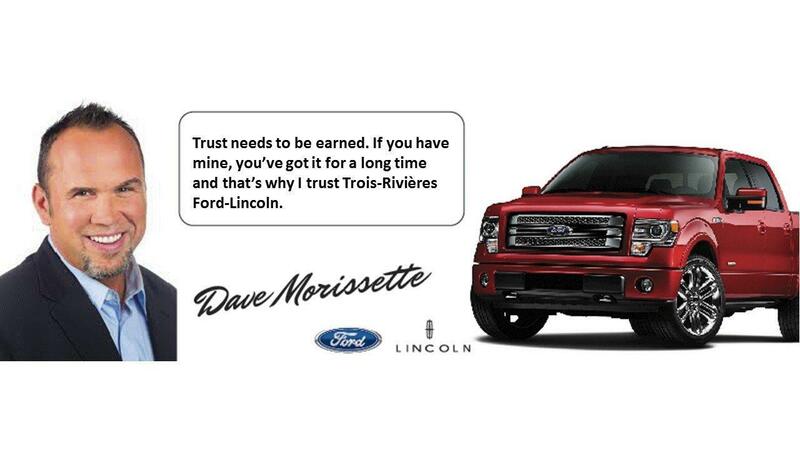 Stop by Trois-Rivieres Ford Lincoln Inc. for all your Ford & Lincoln service needs. Questions? Any of our knowledgeable service and sales people can help. Call 888-698-7118.